Here it is, the one thing I've made all year that I'm most proud of. The longest single culinary project I have undertaken so far. The one component of my wedding over which I was completely, and totally obsessed. To put it in perspective for you, I ordered the third wedding dress I saw. Ordered it on-line, from Nordstrom.com. I chose our invitations in less than 20 minutes, although the woman who owned the adorable little stationary store warned me when I came in that I could make multiple 2 hour appointments if I need them. Yea right. But this cake. I anguished over this cake. I bought books, I looked in magazines, and searched on-line. I took a class, I bought all of the supplies over a several week period. I actually didn't need to practice the painting much, since I have a lifetime of doodling under my belt. My first practice run was right on the cake, actually. I think I must have gotten supremely, incomprehensibly lucky. The cake wasn't perfect, so to speak. It was homemade, by a girl who is far from a professional baker. But it was mine, it was exactly what I wanted, and for us, it was pretty close to perfection. Now I'm going to show you how I did it. The first thing was to make the cake itself. 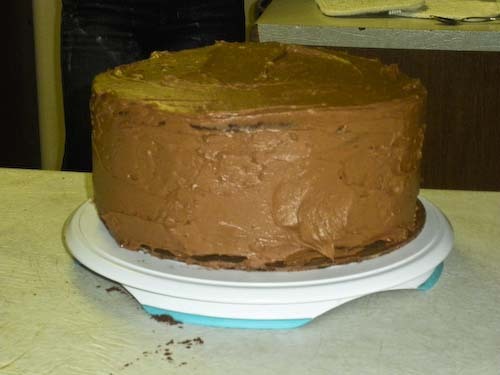 I chose a chocolate cake with chocolate buttercream which I had made several times before. No reason, I figured, to try something new when I was already trying everything new. I tripled the Chocolate Cake with Chocolate Buttercream recipe from Magnolia, which ended up being enough to fill two 10" layers, as well as two 6" layers. I had far too much buttercream left over after tripling the recipe, but found that it was sinfully delicious spread on the loaves of banana bread my mother placed in all of our guests' rooms. We were married in Breckenridge, CO, a ski town to which my family has been going since the beginning, although my parents live in Denver. So I made the cake layers in my mother's kitchen, then triple wrapped them in cellophane and froze them for the trip up. When you're baking layers as large as 10", it's helpful to use a wonderful little invention called Magi-Cake Strips. Basically, they're strips of material which you run under cold water and then pin to the outside of your cake tins as they bake. 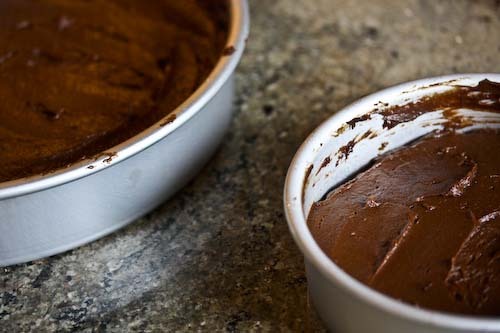 Normally, the edges of the cake bake faster than the middle, which causes the cake layer to dome. Something that can be a real pain if you plan on stacking tiers. Water-saturated Magi-Cake Strips slow the baking of the edges, and prevent this doming. Score. To transport the layers, I kept them frozen and wrapped, and set them on cardboard rounds slightly larger than the layers themselves. Once in the mountains, it was time to get to work. The first thing was to split the layers so they could be filled with buttercream. 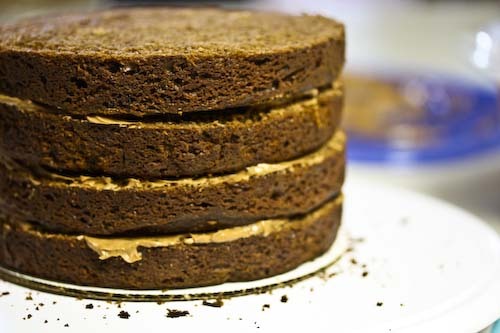 For this, and for most later steps for that matter, a rotating cake stand is pretty much indispensable. The easiest way I've found to split layers is to hold a serrated knife perpendicular to the cake layer and, keeping the knife still and steady, spin the cake stand slowly making a light line in the side of the cake which should be straight and even. Then, use the serrated knife to cut straight through the cake, following that same line. Once this is done, the bottom layer should be placed on a cardboard round which is cut to the exact same size as the cake layer. You can use a dollop of buttercream on the cardboard to act as glue so that the cake layer stays in place. Then spread buttercream between each of the layers, and stack them one on top of the other. Next, use an offset spatula to frost the entire outside of the cake tier. Try to get it as smooth as possible. The buttercream is, first and foremost, the tasty part. But it also acts as a glue to keep the fondant attached. As a side note, you wouldn't want to use a cream-cheese based frosting under the fondant because it would likely go bad. So buttercream is your best bet. Next, for the fondant. Make a mixture of about equal parts powdered sugar and corn starch and use it to prevent the fondant from sticking to the counter and to your rolling pin as you roll it out. For specifics about how much fondant to use based on the size of your cake layer, see this chart from Wilton. 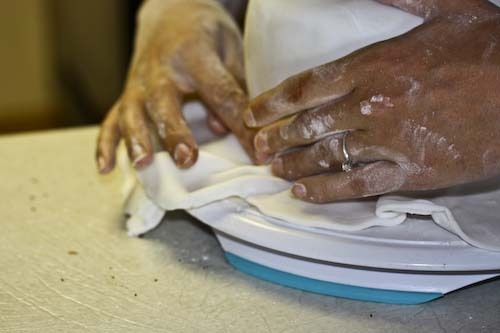 Roll the fondant out so that it is quite a bit larger than the size of your cake. It should be at about a thickness of 1/4". Carefully (seriously, be careful) drape the fondant over your cake, which should still be resting on your rotating cake stand. The fondant should drape down around the cake, hanging over the edge. 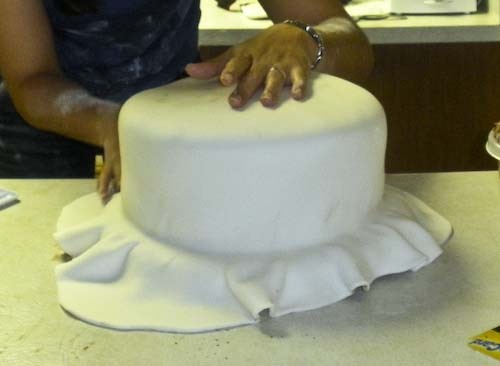 Start at the top of your cake, and begin to smooth the fondant, sealing it onto the top of the cake. You can use your fondant smoothing paddle for this. 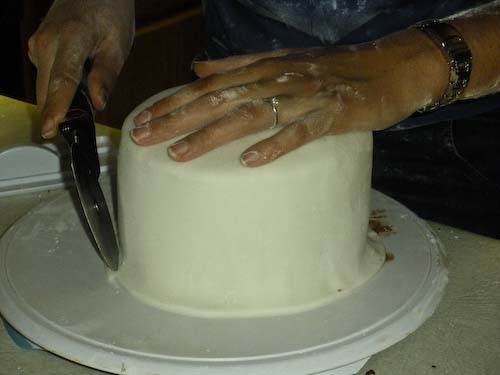 Then, using cupped hands, smooth the fondant over the top edges of the cake, and, turning the cake stand, smooth around the edges. You can switch back to your paddle again so get a really smooth finish (although my finish wasn't perfect, there were lumps etc. But whatever). Smooth down to the bottom of the cake, and push down gently, making a kind of light crease at the bottom where the cake meets the stand. 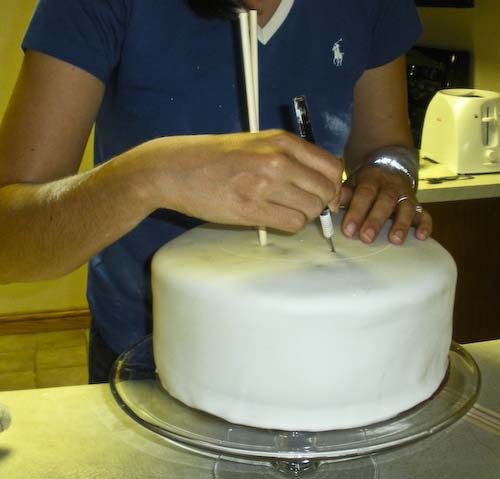 Now, using a pizza cutter, cut off the excess fondant from around the cake tier. Carefully slide your cake tier off of the stand and repeat the process on the next tier. Once both tiers are covered, transfer your base tier to the display stand you plan on using. Now it's stacking time. Cake, as it turns out, is not that sturdy of a building material. And even on a relatively small cake like mine, the bottom tier needs a little help supporting the top tier. So you have to stick wooden dowels down through your bottom tier to do the supporting. So, using an extra cardboard round that is cut to the size of your smallest tier (in this case, a 6" round) place it on the center of the largest tier. Using an exacto knife, lightly trace a circle around the cardboard to serve as your guide. Remove the cardboard, and, again using an exacto knife, cut away a bit of fondant on the top of the cake, just large enough for one of your wooden dowels to fit into (you can buy these dowels at a good cake supply store). Now, shove your dowel down into your cake, and mark the exact spot where the dowel is flush with the top of your cake. Remove the dowel. Repeat with about 4 more dowels, placing them in a circle, with one or two perhaps in the center. Now cut each of your dowels at the point you marked, and put them back into the cake. Okay, now your smallest tier should already be resting on a cardboard round which is cut to the exact same size. So now all you have to do is place (carefully!) the smaller tier on the dowels and you're done! Well, with that part, anyway. The fun part, at least for me, was the decorating. I bought some edible food coloring in powder form and mixed it with lemon extract until it was roughly the consistency of paint. Then, using an artist's paintbrush from the craft store (a new one, of course) I painted my design around the top. I used a real brown ribbon to hide any mistakes around the bottom, and secured it with a small drop of glue, that was only on the ribbon, not on the cake. Top with fresh flowers, perhaps. By the way, I didn't take those photos of the finished cake. That was our photographer, Gary Soles, who is a truly amazing landscape photographer in Breck. If you don't check his work out here, you'll be missing out on some of the most beautiful photos I've ever seen. 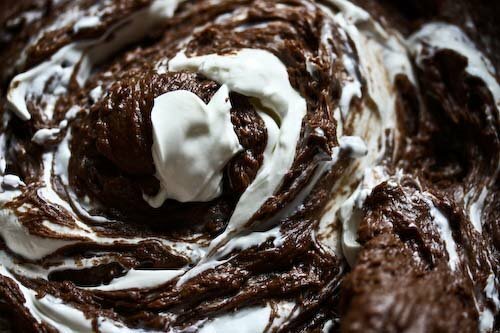 UPDATE: want the recipe for that luscious chocolate cake? I've posted it in the form of cup cakes. But be reminded that the recipe was tripled for the wedding cake. Wow, Andrea. 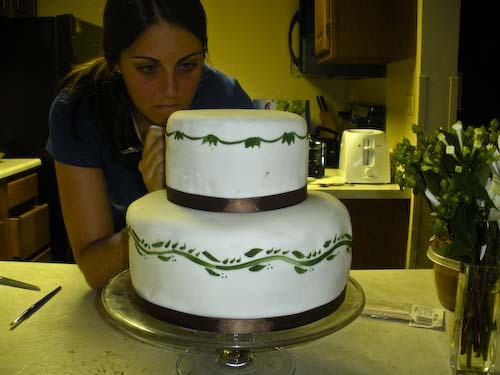 I do consider myself a baker and yet I have never attempted fondant and the wedding cake I made for Randy and I was nowhere near that gorgeous. Granted, it was almost 7 years ago, but still. Great job and congratulations again! Wow, you should be so proud. You did a beautiful job, truly talented. It looks to me you had the perfect wedding. Congratulations. Beautiful cake, so well done! Congratulations! I'm in awe--you've conquered fondant and created such an architectural masterpiece all in one. Congratulations. Also, Magi-Cake Strips sound genius. Thanks for the tip! Wow, Andrea - what a gorgeous cake!! You did such a beautiful job. I loved seeing the step by step pictures; thanks for sharing. Congrats on your marriage! Looks like it was a breathtaking location. Congratulations on your wedding, and on an awesome self-made wedding cake :) I've been following your blog for a while, and, being Norwegian, love the fact that you try out some Norwegians specialties! Stunning, totally perfect cake! And that last photo is just lovely. Congratulations, on both counts! you're amazing. i love it; it's beautiful. i love the last photo, reminds me of home. That is an absolutely stunning wedding cake! My mother ran a catering business for 20 years that specialized in wedding cakes and I grew up watching her spend days baking, assembling, and decorating wedding cakes. It's no small feat! Congratulations Andrea, you looked so beautiful on your wedding day! And that cake is amazing, so classy - I love the ribbon detail. My neighbor is getting married next Spring, and asked me to make the cake, so I might be filling your inbox with questions when the big day gets closer. Thanks so much for sharing, I would love to see more wedding pics when you get them! Thanks for the congratulations, everyone! Hayley, definitely let me know if you need any help or recommendations. I don't claim to be an expert, but I did learn a thing or two! Congratulations again! This is a beautiful cake and it looks like your wedding was amazing. It's a beautiful cake. You did an amzing job. Congratulations! That is so beautiful!! You are amazing. I'm speechless that you actually made your own wedding cake! Although the design is simple, it's truly elegant. Beautiful cake, I'm so impressed! First, I wish you a happy and long life together. About the cake, I am speechless. You did a magnificent and really brave job. Congrats! Your cake is simple and understated and so, so elegant. I especially love the arrangement on top. Just beautiful. I'm so proud of you for having done this! I fantasize with making my own cake, but I'm intimidated by the amount of work. 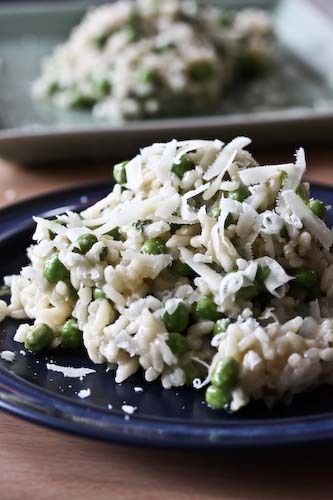 Thanks for sharing you recipes, technique and step-by-step process. And for the photos!! Whoa! Impressed Andrea. That is an absolutely adorable cake. Beautiful. And I think you very brave. Congratulations on your lovely cake and getting married! I'm so impressed with your cake! You did a marvelous job - it's gorgeous! Congratulations! It is beautiful. Good job! Absolutely gorgeous! I'm so impressed. Well done! Your cake is gorgeous. What great symbolism, I think, to bake your own wedding cake. Also, I'm envious of your wedding setting. There's no place more beautiful in the world than the Colorado Rockies. Congrats for getting married! Congrats for spending the money you wanted to and having a beautiful wedding. I recently went to a wedding, it was far too over done for my taste. I spent my time floored by what they spent, not on how much they love each other. Twenty years from now you will be glad you did it this way! I paid $100 on my dress, it was gorgeous. I did what I wanted to, something pretty and simple. Wow! Looking at your post, I now feel like I could actually make a wedding cake! Yours turned out so beautiful and elegant! It's lovely! I hope your marriage is every bit as beautiful. Amazing. Beautiful + congrats! I took your advice and got Magi-Cake strips and they're the best baking accessory I've gotten in years! Thanks! I made my friends' wedding cake last summer and it was my first wedding cake. I learned a lot!!! 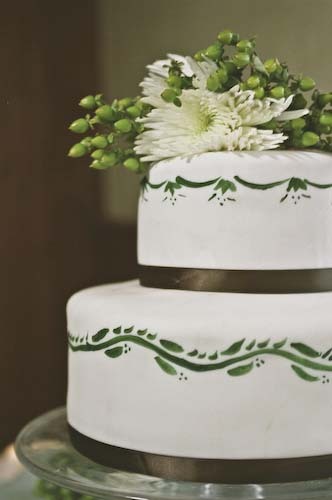 Check it out here: http://hanaaskitchen.blogspot.com/2009/06/my-very-first-wedding-cake.html. Next week I'm making my friend's son a bday cake and I'm planning on using fondant which is how i landed on your blog. Looking for tutorials and such because i never used fondant before. Should be fun experimenting with it this wknd. I made my own wedding cake.. using my grandmother's pound cake recipe and buttercream frosting. I used fresh edible flowers to decorate it. I've never tried to make fondant... you inspired me to try it! I was looking at your plum cake recipe and saw this cake in the "you might also like" and knew I had to take a peek. I'm really quite impressed with your cake making skills and that you made your own wedding cake! Kudos to you! Your wedding cake looks superb. 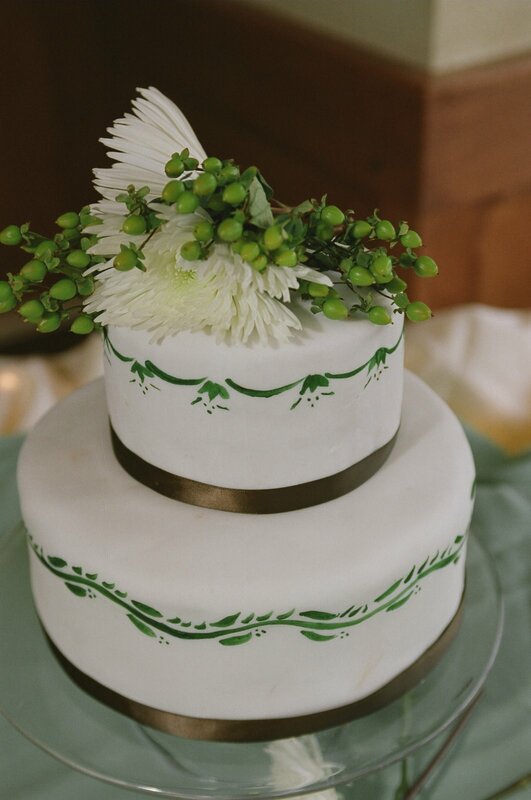 I am truly in love with this cake design and it is perfect for your nature themed wedding. We will also have outdoor ceremony at one of best Los angeles wedding venues and would also try to make cake on my own with expert guidance.